Before we were going for a day tour today, we had breakfast at the hotel earlier in the morning. The buffet breakfast in this hotel was really good. So many choices from cold to hot type food and they also serve fresh made-to-order Jamu which is a traditional healthy drink, mixed from herbs and spices. Today we went to Dieng Plateau, is about 3 hours drive from Yogyakarta city up to the mountain. Dieng is an active volcano region and the Plains formed from volcanic crater that has died. Visiting the Telaga Warna (colourful lake) and Kawah Sikidang (Sikidang Crater). When we were there, the weather wasn't that good, therefore we couldn't get the beautiful color reflection on the lake as the water got a little muddy and there were no sunshine. However, we still can see the pure green color lake and how lush the forest and surroundings. Then we headed to Sikidang, where the sulphur is still coming our from the crater. The smell is so strong that you need to wear mask. On some day where the sulphur is poisonated, people are not allowed to hang around there. 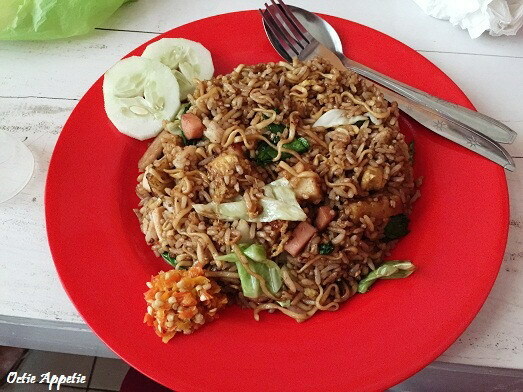 Nasi Goreng Jawa is the Javanese version of fried rice. Sweet soy sauce based fried rice and egg noddle and is normally served with chicken, egg and vegetables. 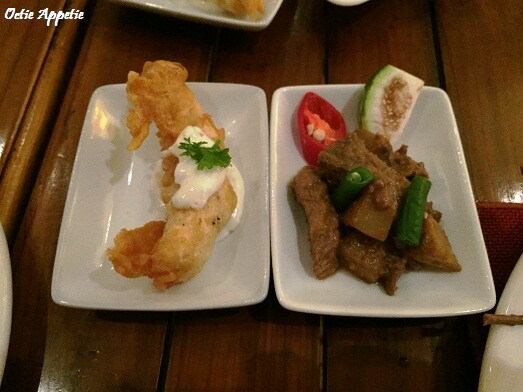 Not forget to eat with sambal too.